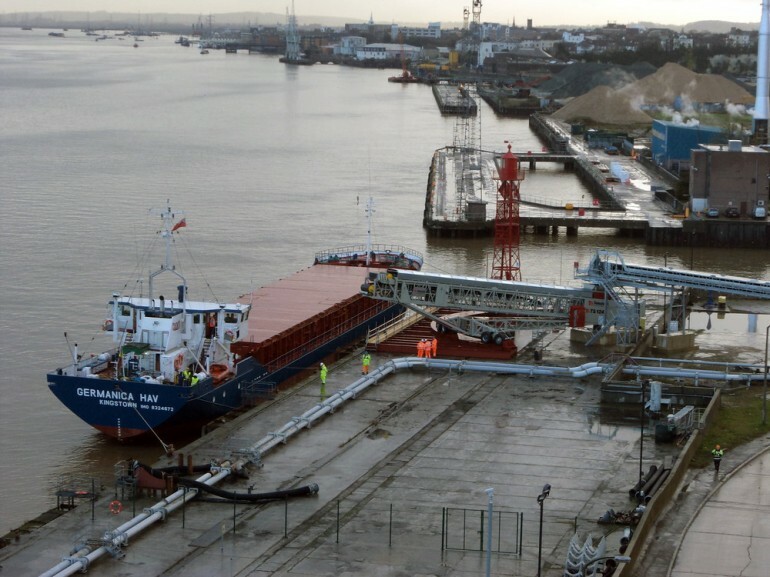 First shipload of earth from London’s new rail tunnels arrives at Wallasea Island - Crossrail . For information about the Elizabeth line please visit the Transport for London website. The first shipload of earth from Crossrail’s new tunnels under central London has arrived at Wallasea Island in Essex. The 1,900 tonne maiden load arrived from Crossrail’s transfer facility at Northfleet in Kent. Since July nearly 60 ships have delivered 120,000 tonnes of earth to Wallasea Island from Docklands, where excavated material from construction works at Crossrail’s new stations is loaded. The earth from Crossrail’s tunnels and stations will be used to create the UK’s most ambitious man-made coastal nature project and will guarantee a place for tens of thousands of migratory birds and combat the threats from climate change and coastal flooding. Crossrail will deliver 4.5 million tonnes of earth to Wallasea Island over the next four years. The majority of it will be from the new 21 kilometre twin tunnels running under central London. About 1.2 million tonnes will come from the western tunnels being constructed between Royal Oak and Farringdon. Material is also being removed from excavations at the new Crossrail stations and from the construction of 12 kilometres of passenger and platform tunnels being built under those stations. Earth from Crossrail’s western tunnels is being transported from the tunnel entrance at Royal Oak to the Northfleet holding facility by freight train. It is then loaded onto ships destined for Wallasea Island. Further ships will transport excavated material to Wallasea from the eastern tunnels site near Canning Town station via the Docklands Transfer Site. Crossrail will excavate about six million tonnes of material during the construction of stations and its 21km of twin-bore tunnels. Close to 100 per cent of the excavated material is expected to be clean, uncontaminated and reusable elsewhere.